K-Pop girl group BLACKPINK made their live U.S. TV debut on Feb. 11. The ladies stopped by "The Late Show with Stephen Colbert" to perform "Ddu-du Ddu-du." Ahead of the news of their first U.S. tour, BLACKPINK, comprised of members Jisoo, Jennie, Rosé and Lisa, dropped by Stephen Colbert's late-night talk show. The ladies performed "Ddu-du Ddu-du," the K-Pop trap banger that's also currently the most-viewed music video on YouTube by K-Pop group, edging out BTS' "DNA." 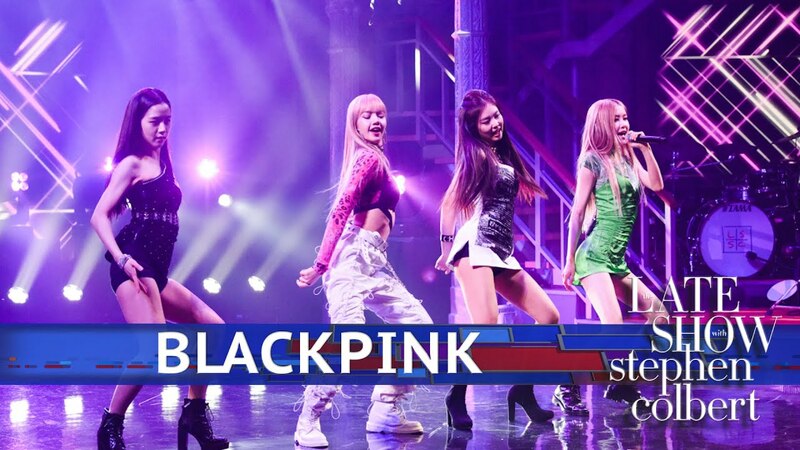 BLACKPINK popped off on Colbert's stage with an impactful performance. This spring BLACKPINK will embark on their first trek in the U.S. titled the In Your Area 2019 World Tour. The tour will include stops in major cities like Chicago, Los Angeles and Atlanta. It kicks off following the group's groundbreaking debut on the Coachella stage in April. The ladies will make history as the first K-Pop girl group to headline the music festival. "Ddu-du Ddu-du" is now available on iTunes and Apple Music alongside BLACKPINK's Square Up EP. The single previously charted at No. 55 on Billboard's all-genre Hot 100 chart and the EP hit No. 40 on the Billboard 200 chart, making BLACKPINK the highest charting K-Pop girl group on both charts in the U.S.